Mohs micrographic surgery is an advanced treatment for skin cancer that has the highest cure rate of all skin cancer treatments offered today. The technique was named to honor Doctor Frederic Mohs who developed this innovative technique. Mohs surgery is the only treatment option that evaluates 100% of the surgical margin at the microscopic level thus resulting in the highest success rates of all skin cancer treatment options. Why should I have Mohs surgery done on my cancer? Mohs surgery is indicated for cancers on the head, face, ears, neck, hands, legs, feet and groin. Essentially, this technique should be performed on areas that demand a high level of tissue preservation and cosmetic appearance to maintain function. Other indications for Mohs micrographic surgery include large tumors, ill-defined tumors, tumors located within scars, rapidly growing tumors, or recurrent tumors when other techniques have failed. Are there other advantages to Mohs surgery? Yes! This technique is unique because of the way it is removed and evaluated under the microscope. Fellowship trained Mohs surgeons spend at least an extra year of additional training to specialize in this technique so that they can remove the tumor, evaluate all of the surgical margins under the microscope, and repair the defect all within the same day. This means you can be assured that your cancer has truly been removed before you go home. Furthermore, because the sections are evaluated microscopically while you are in the office, your Mohs surgeon only needs to remove 1-2mm of skin around the tumor which minimizes the amount of tissue that has to be removed. This keeps the surgical defect as small as possible, minimizes the risk of recurrence, and maximizes the tumor cure rate. We will first review the procedure and answer any questions you might have. Then we will evaluate the site once more. If you have biopsy photographs bring them as we will always review our photographs and biopsy reports on the day of surgery as well. Next, the site is marked with a surgical marking pen. Afterwards the affected area is cleaned and a local anesthetic is used. At this point the tumor is removed along with a narrow one millimeter rim of normal tissue to ensure the tumor does not invade healthy appearing tissue. These specimens are then inked and mapped and brought back to the DSI laboratory for processing. The Mohs surgeon then evaluates the specimen under the microscope to ensure no tumor cells remain. If any tumor cells remain, the area of concern is correlated with the Mohs map and the affected tissue is removed and checked in the same manner. This process takes about 75 minutes and repeats until the tumor is completely removed and then the site is repaired. We cannot predict how many layers must be taken to ensure complete removal. Therefore we cannot estimate how long you will be with us but we would like you to be prepared to spend the majority of the day with us. Please dress comfortably, bring a sweater, your favorite snack, a bagged lunch, and a book or other device to keep you occupied during the waiting periods. It is also recommended that you have someone else transport you to and from our office on the day of surgery but this is typically not required. We will give you post-operative instructions, schedule a follow-up appointment, and answer any questions that you may have. If you have any questions ahead of time please write them down so we can be sure to review all the information that is important to you. If your repair involved sutures we will remove them at the follow-up appointment. 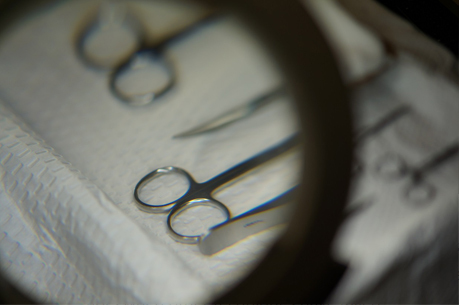 If you did not have sutures, we will evaluate the surgical site to ensure an optimal healing environment. After the site has healed, we recommend that you return to your referring physician for routine monitoring. Are there any side effects from surgery? The only side effect we expect is a scar. Any type of surgery will result in a scar but we specialize in hiding the scar to the best of our ability within a natural skin fold or crease. Scars start out bumpy and red but usually settle down in a few weeks. In fact, scars continue to remodel and improve for nearly a year! While other side effects are possible, they are rare. Please notify the clinic with any questions or concerns you have before or after surgery so we can optimize your care.